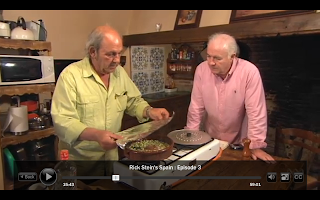 Thanks ABC for airing Rick Stein's Spain - just caught up on Episode 3 over on iView (sorry non-Aussies you might not be able to view it). I'm finally settling in to my new place in my old city, now single once more, and I am warming up to the idea of some more experimental cooking. I find at a time like this, when I'm still trying to find my feet, and my centre, I do tend to stick to tried and tested "experecipes" and comfort food. Now that I'm a bit more sorted, the urge to set fire to things, erm, and make tasty new dishes is coming back slowly but surely. "It’s a mystery… passion… I mean, cooking is an artistic thing, I cannot paint a nice picture but I can do something here full of colour, but not only colour… smell... taste... everything! Everybody must do that. Why not?" Ah, cooking. So universal, so beautiful and always something to learn from so many different people! Bring it on!